In April 2001, we sent questionnaires to about 5000 people who were registered in the category of Japan of our pen pal service, and who indicated that they are willing to participate in surveys. We received 835 valid responses from Japanese people who live in Japan. As always, over two thirds of the respondents were below the age of thirty, i.e. this survey is in no way representative for the whole Japanese population. However, it shows the trends among the younger Japanese generations. Sushi is not only the most famous Japanese food, but also one of the most popular among Japanese and non Japanese. Sushi comes in many forms: the classical nigiri sushi (small rice balls with fish and other small pieces of food on top), gunkan sushi (seafood in small cups made of sushi rice and seaweed), norimaki (sushi rolls), temaki sushi (sushi rice, seafood and other food in cones made of seaweed), chirashi sushi (seafood spread over sushi rice), inari sushi (sushi rice in small bags of deep fried tofu) and many more. But one ingredient is always present: sushi rice, cooked Japanese rice flavoured with sushi vinegar. In Japan, sushi is usually still considered a special meal for special occasions, and is, therefore, eaten relatively rarely. Only about one quarter of the survey respondents eat sushi more than once per month, another quarter enjoys it just about once a month, and 35 percent once in two to four months. The remaining 13 percent eat sushi even less frequently, however, only three percent responded to never eat sushi at all. Next, we wanted to find out which sushi types are most frequently eaten. Survey participants were asked to select out of a list of 24 sushi types, the ones that they eat frequently. First of all, it must be said that in Japan nigiri sushi are most common and probably most readily associated with the term "sushi". This stands in contrast to some other countries where sushi rolls are often more common than nigiri sushi. In our hit list of sushi types, nigiri and gunkan sushi occupy all top spots. According to our survey results, Maguro (tuna; nigiri) is by far the most frequently eaten sushi type. 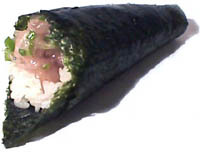 60 percent of the respondents answered that they eat Maguro sushi frequently. Following Maguro come Ikura (salmon eggs; gunkan), Toro (fatty part of tuna; nigiri), Anago (eel; nigiri), Ebi (shrimp; nigiri) and Ika (squid; nigiri) with each about 42 to 45 percent. 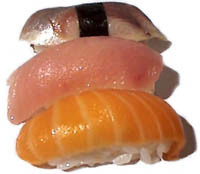 In a third group of frequently eaten sushi types follow Hamachi (yellowtail; nigiri), Sake (salmon; nigiri), Tamagoyaki (fried egg; nigiri) and Uni (sea urchin; gunkan) with 35 to 37 percent. In our next questions, we asked survey participants to select their most and least favourite sushi types. 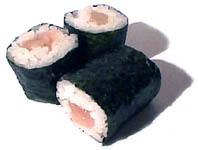 According to our survey results, the most popular sushi type is Toro (nigiri), the fatty, more expensive part of tuna. 45 percent of survey participants answered that Toro is one of their favourite sushi. At the same time, only 9 percent indicated that they dislike Toro. On the second place of our sushi hit list follows Uni (sea urchin) with 32 percent. The creamy, brown sea urchin with the strong flavour that is usually served as a gunkan sushi is one of a few sushi types which is at the same time loved by many and disliked by almost as many. For Uni is also placed second in our list of most disliked sushi type with 28 percent. Ranked third in our list of most favourite sushi types is Amaebi (raw shrimp; nigiri) with 31 percent, followed by Ikura (salmon eggs; gunkan) with also 31 percent. 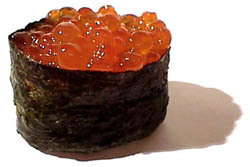 Like Uni, Ikura is also disliked by many (19%) probably due to its strong flavour. Other favourites are Maguro/Tuna (30%) and Anago/Eel (29%). Among the disliked sushi types are several fish with shiny skins: Saba/Mackerel (30%), Iwashi/Sardine (20%) and Aji/Horse Mackerel (20%). Also ranked high in the list of disliked sushi types are the chewy Tako/Octopus (20%) and Ika/Squid (19%). The survey results show minor differences between the genders. Sushi types more popular among women than men are Amaebi (raw shrimp), Ikura (salmon eggs) and Sake (salmon). On the other hand, Toro and Maguro (tuna), Uni (sea urchin) and Anago (eel) are more popular among men than women. Furthermore, many more women responded to dislike certain sushi types than men: Uni, for example, is disliked by as many as 37 percent of the women, while it is unpopular among only 19 percent of men. Sashimi is thinly sliced, raw seafood. Many different kinds of fish (and other types of seafood) are served raw in the Japanese cuisine. Of course, the fish has to be as fresh as possible. Sashimi can be eaten just as sashimi or as nigiri sushi, in which case the sashimi piece is put on top of a small ball of sushi rice. Sashimi pieces are dipped into soya sauce before they are eaten. Depending on the kind of sashimi, wasabi or ground ginger is usually mixed into the soya sauce.